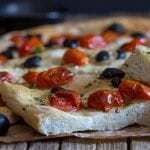 Focaccia Pugliese, a simple homemade Focaccia baked with tomatoes, black olives, oregano and olive oil. The perfect appetizer or main dish. In a small bowl add honey and warm water (stir to combine) then sprinkle the yeast on top. Let sit 5 minutes and then stir to combine. ** This can be made using a stand up mixer with the dough hook, knead the dough on medium speed until smooth and elastic (approximately 7 minutes), move to a flat surface and knead a couple of times into a ball. Place the dough in a lightly oiled glass bowl (and swirl the dough so that it is lightly covered with oil). Cover the bowl with plastic and a clean tea towel and let the dough rise 2 hours in a warm draft free area. Pre-heat oven to 400° (200° celsius), lightly oil a 12 inch (30cm) pizza pan. Remove the dough from the bowl and punch it down a few times. Place dough on the prepared pizza pan spread the dough, then cover it and let it rest for approximately 15 minutes. Spread the dough again if needed. Using your finger tips or knuckles make indentations in the dough. Top the focaccia dough with sliced tomatoes and sliced black olives, then sprinkle with oregano, drizzle with olive oil and sprinkle with salt. Bake for approximately 15-20 minutes (check after 15 minutes). Serve warm. Enjoy!